With back-to-school season underway, students and families are heading in to another exciting academic year. Teachers and other mentors – including the nationwide network of nearly 500 Scholarship America Dollars for Scholars affiliates – are also getting ready for another year of supporting students. This all-in endeavor to help students reach their fullest potential is why we recognize affiliates each year through our Dollars for Scholars Affiliate Awards Program. It’s designed to honor affiliates that actively implement the mission and goals of Scholarship America, and make exemplary achievements to advance their local efforts. National finalists, often represented by various regions across the U.S., receive a $1,000 scholarship to award one of their students. National winners earn another $2,000 for their programs. This year, Scholarship America asked Dollars for Scholars affiliates to focus on one of four areas of exemplary achievement: fundraising and financial management; volunteer recruitment and management; marketing and community engagement; or student engagement, support and tracking. Finalists and winners were then selected by Scholarship America’s Student Success Programs team. We’re thrilled to announce this year’s outstanding class of affiliate and volunteer winners – those who represent best practices in promoting student success in their communities. Burlington-Edison Education and Alumni Foundation Dollars for Scholars has been dedicated to administering, creating and funding local scholarships for the past 24 years. The affiliate’s commitment to its Northwest Washington community has allowed decades of students to pursue their college, technical or trade school education. This past year, the affiliate increased community awareness through its Senior Salute Reception – a well-respected event that raised enough financial backing for six new scholarships. They continue to build upon excellent work: In 2009, Burlington-Edison Education and Alumni Foundation Dollars for Scholars was recognized as Chapter of the Year for the State of Washington. A 2011 Regional Chapter of the Year, Calvin Coolidge Alumni Association Dollars for Scholars continues to support high school seniors at Calvin Coolidge High School in Washington, D.C., and strives to keep in contact with their alumni from the past 29 years. On top of scholarship awards, the affiliate’s work extends beyond D.C., as they host a student exchange program with the Dominican Republic. This is the second consecutive finalist appearance for Whitman & Hanson Dollars for Scholars, a Massachusetts affiliate that has experienced much success in helping graduating Whitman-Hanson high school seniors. In 2016 alone, Whitman & Hanson Dollars for Scholars gave more than $125,000 in scholarships thanks to generous residents, donors and volunteers who have helped decades of students attain their postsecondary education. 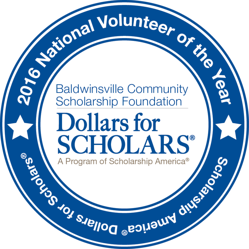 The incredible work of Dollars for Scholars is made possible by volunteers who offer their time and skills in service of their communities – volunteers like Sandra, who has played a critical role in making fundraisers and events possible at Baldwinsville Community Scholarship Foundation Dollars for Scholars. Sandra organizes high school students in this New York community to carry out the affiliate’s annual phone-a-thon fundraiser, coordinates the school’s Moving Up Day scholarship ceremony, and still manages to fulfill her duties as recording secretary for the affiliate. All of these contributions have been part of a lasting legacy, with the affiliate distributing 2,300 scholarships totaling more than $2 million since 1974. Diana currently serves as a board member for Enderlin Area Dollars for Scholars – a North Dakota affiliate that has served Enderlin Area Public School students since 1992. Her dedication to students is long-standing, with more than three decades in education, and has helped the affiliate award more than $85,000 to over 210 students since its founding. “Investing today, in tomorrow’s leaders” has helped guide Jamestown Dollars for Scholars to 35 years of service to the Jamestown Public School System. Tena’s contributions as a board member of this North Dakota affiliate, as well as her leadership position at the University of Jamestown, have all pointed to her commitment to help students pursue their higher education. *Although Scholarship America had no Volunteer of the Year nominees from the Western region, the selection committee received such strong representation in this category overall that they awarded a second finalist from the Central/Southeast region. Congratulations to the national winner and the two finalists, both of whom hail from North Dakota! To learn more about Dollars for Scholars, and how you can get involved, visit ScholarshipAmerica.org.